Phone Tips Social Media Is your target Phone WhatsApp Compliant? Find out! 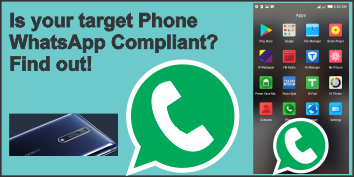 Is your target Phone WhatsApp Compliant? Find out! Despite the high number of users that WhatsApp has, it’s unfortunate that not every smartphone user will get to use this app on their phone. This is because, on January 1, 2018, the giant social media company withdrew development supports for a particular number of smartphones. What this means is that, once you purchase any of the affected phones, you will not be able to use the app on the phone. As the company noted, the affected phones do not support the goals of developing the app to cover its used and such have ceased future upgrades to such phones. These platforms don't offer the kind of capabilities we need to expand our app's features in the future. If you use one of these affected mobile devices, we recommend upgrading to a newer OS version, or to a newer Android running OS 4.0+, iPhone running iOS 7+, or Windows Phone 8.1+ so that you can continue using WhatsApp. To avoid falling a victim of this, I have compiled the categories of phones to aid you to make the right choice. Though you might not consider purchasing any smartphone, it’s however, worth knowing for future needs. If you’re new to this, as I assume for some people, you might begin to wonder why this app has been so pronounced that every phone manufacturer thinks about developing a WhatsApp compliant smartphone and users mostly want to buy phones that support the use of the app. WhatsApp is a social media application that allows connected people to communicate freely using cellular data without hidden charges. It has successfully staged a parallel competition with Facebook for Instant messaging, video calls, group chats, but goes beyond that to feature file sharing – images, documents, PDFs, etc. Providing lightweight communication makes it even preferred, as official discussions can be held. Reportedly, some families separated by geographical locations use WhatsApp for their family prayers. Of course, you can send recorded voice files, videos and animations. Likewise, you can share your memories and fun-fares with your contacts. These add an entirely new dimension to the joy of using it. One can express his or her thoughts, send wishes, and support an ideology to all contacts using the status update. More to it is the groups that allow people of relatively close interest to interact digitally. Tutorials, seminars, classes, and forums are held using the application. Digital marketers use it as an addition to the marketing pillars or sources for their companies, products and services. All these make WhatsApp a must have and as such, any smartphone lacking proper support for it should not be considered except when it is intended for other purposes, while another is used for catching the fun on social media. Below are the different groups of phones that are supported by WhatsApp. Optimistically, future technological dynamics might reverse this situation for some of the companies and the affected phones. This is, however, a dream which might or might not come true. So, take a careful look at the lists. You can equally bookmark or save this page for quick reference whenever necessary to be on the safer side. Android-based phones are top brands and that has reflected greatly in the wide range of support for WhatsApp. The least Android OS using WhatsApp is Android 2.3.3 which is rare to find these days as several versions have been released. This implies that phones with Android versions such Oreo, Lollipop, Marshmallow, Nougat, etc. are fully supported. Just like Android phones, Nokia phones have gained a plethora of support for WhatsApp, though not all. The Nokia Asha brands appear to be the most supported. While some of these brands of Nokia phones will keep enjoying the features provided by WhatsApp, Nokia S40 features among others without support. Nokia 206 Single and Dual SIM, Nokia 208, Nokia 301 (both Single and Double SIM), Nokia 515, Nokia Asha 201, Nokia Asha, 205, Nokia Asha 210, Nokia Asha 230 (single and dual SIM), Nokia Asha 300, Nokia Asha 302, Nokia Asha 303, Nokia Asha 305, Nokia Asha 306, Nokia Asha 308, Nokia Asha 309, Nokia Asha 310, Nokia Asha 311, Nokia Asha 500, Nokia Asha 501, Nokia Asha 502, Nokia Asha 503, Nokia C3-00, Nokia C3-01, Nokia X2-00, Nokia X2-01, Nokia X3-02, and Nokia X3-02.5. Just like every other brand of phone, best support comes with the latest Operating Systems. WhatsApp for iPhone requires iOS 7 as the minimum supported OS. Versions lesser than are not supported. In case you find yourself using a lesser version of the stated OS on your iPhone, the performance, will definitely, be lacking cool features. There is not support for iPod-based or tablet-based iPhones. It's unfortunate that quite a number of Windows phones lost support for WhatsApp from January 1, 2018. Users of these phones will have to upgrade to Windows 8.1 or higher to use WhatsApp. Phones running on Windows 8.0 and Window 7 are no longer supported. Blackberry phones are the most affected by this development as almost all of them have lost support for WhatsApp. WhatsApp expressly announced their intention to discontinue the development and support for Blackberry as a scaling up decision. There is, however, good news for users of Blackberry Priv and DTEK50. These phones are supported Android devices and as such, users will have nothing to fear about. The developers of this app have decided to scale up and improve the features in order to meet their mission. On your part, keep this in mind when purchasing your next smartphone if you still desire to socialise with your friends and family. Share this to keep others informed!